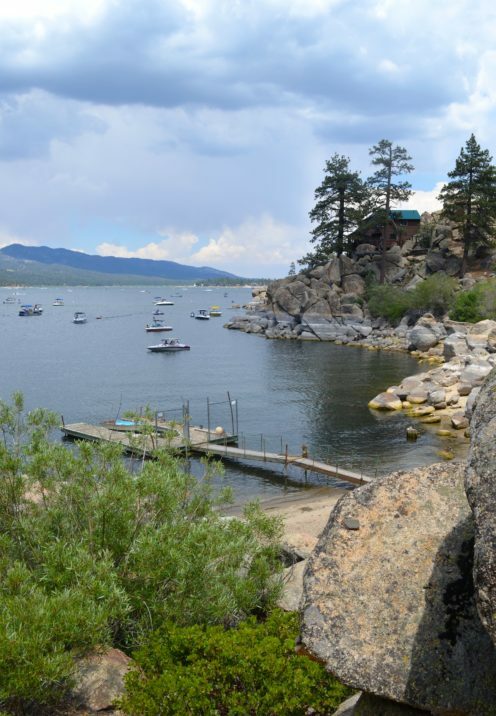 Greeting and welcome to Big Bear Lake, California, the beautiful mountain resort just 2 hours from Los Angeles where many celebrities have second homes. 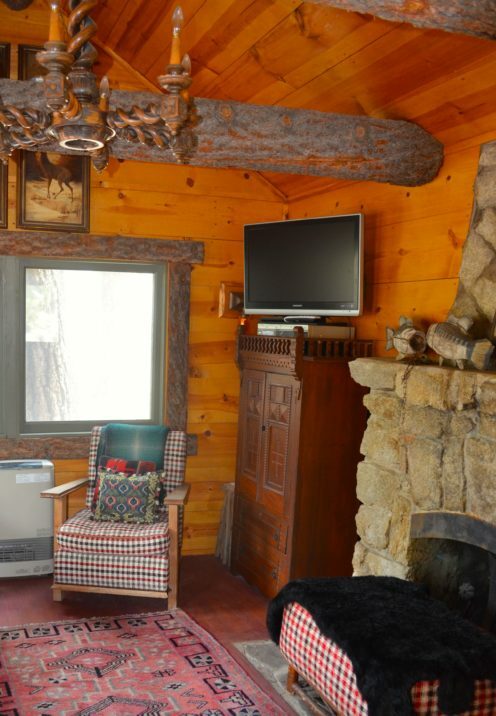 It’s also where my log cabin vacation rental, Stone Hill Cottage is located, and where I’m always looking for the next fixer-upper. 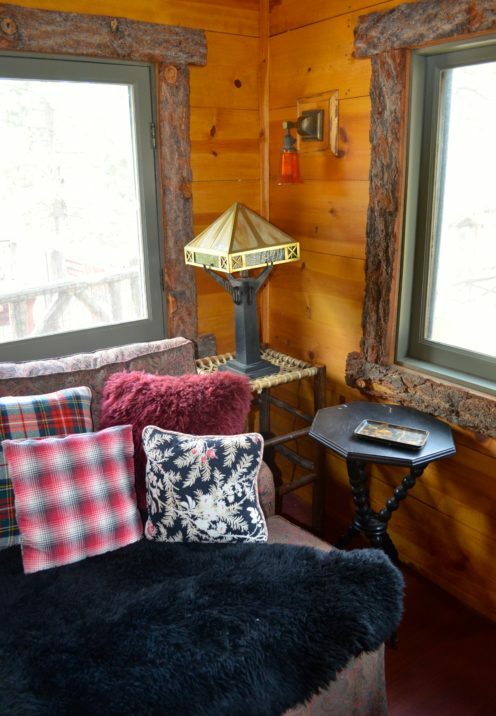 On one such home buying mission my realtor took me to see an uber charming lakefront cabin that just happened to be the mountain retreat of celebrities Rebecca Romijn & Jerry O’Connell. 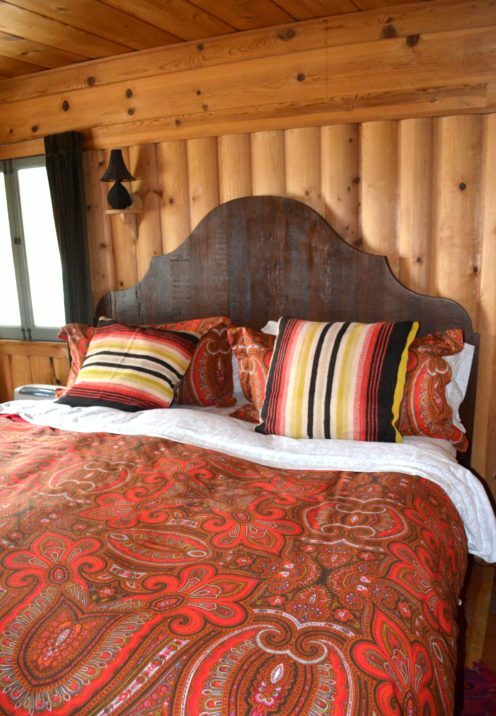 We instantly fell in love with this very special property, but because it is located on National Forest Service leased land, it can’t be used as a vacation rental, so unfortunately it did not fit the bill for our needs. Plus, it was far from a fixer-upper! It has since been sold to some very lucky new owners. 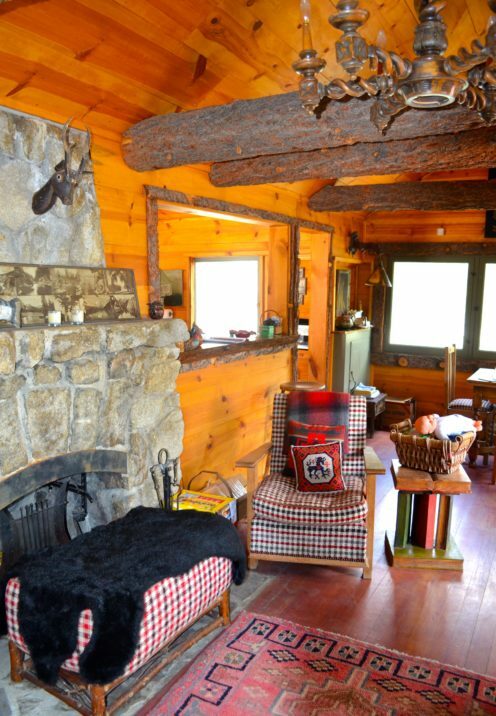 I took lots of photos of the cabin during my visit, so today we will tour the charming former lake house of Rebecca Romijn and Jerry O’Connell. 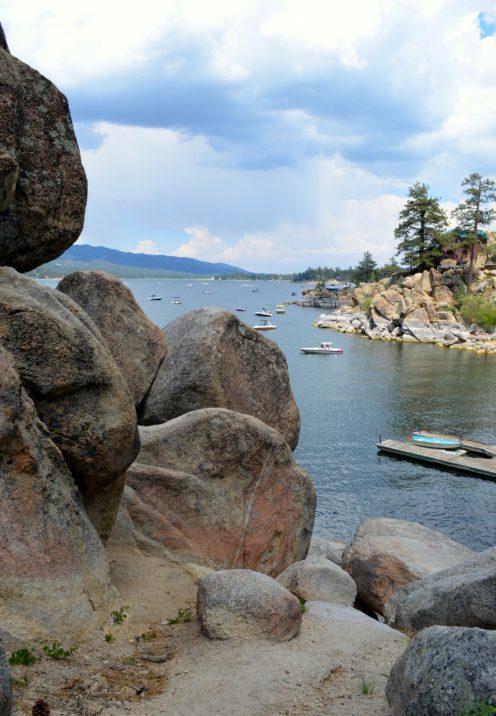 The property actually consists of 3 separate cabins clustered together among giant boulders in a magnificent, lakefront setting. The main cabin, the one you see on the right in the photo below, consisits of nothing more than a living room, small dining area and the kitchen. 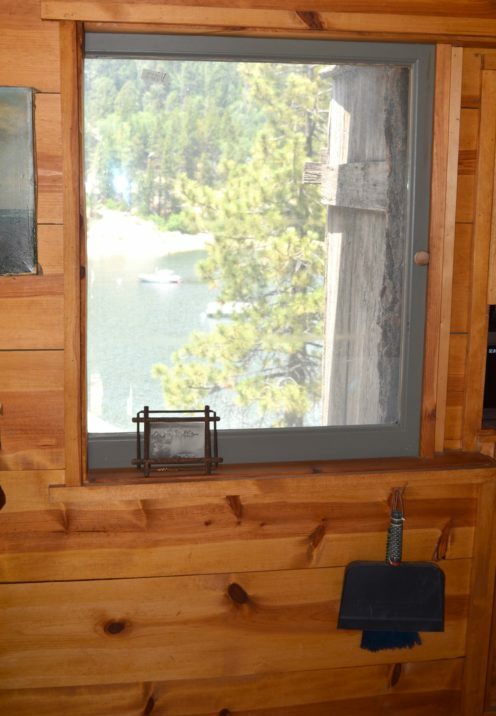 It also has a large front deck that provides wonderful lake views. The cabin behind it houses 2 bedrooms and a bathroom. 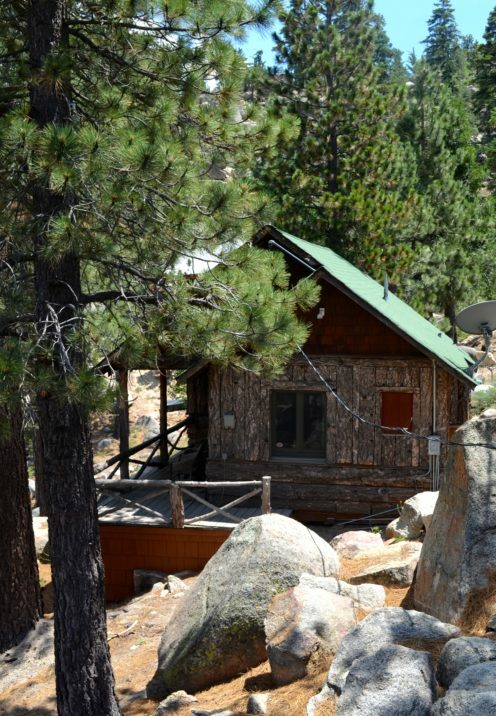 The two cabins are separated by a small set of outdoor stairs which would not be a pleasant journey in the dead of winter with snow on the ground. 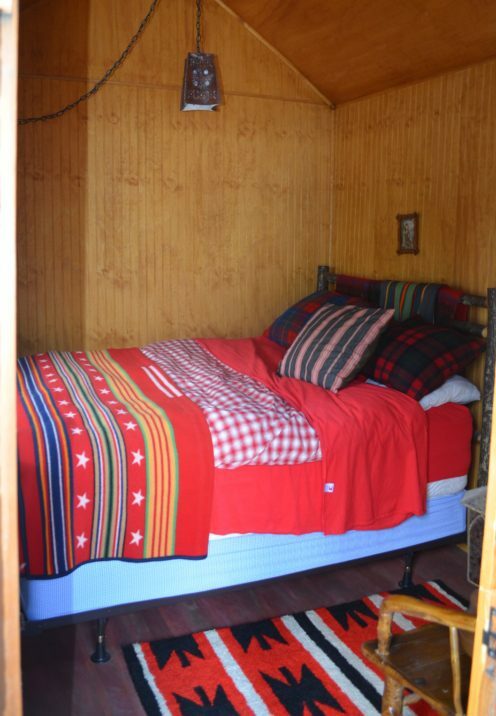 But the charm contained inside the cabins would make the effort worthwhile. 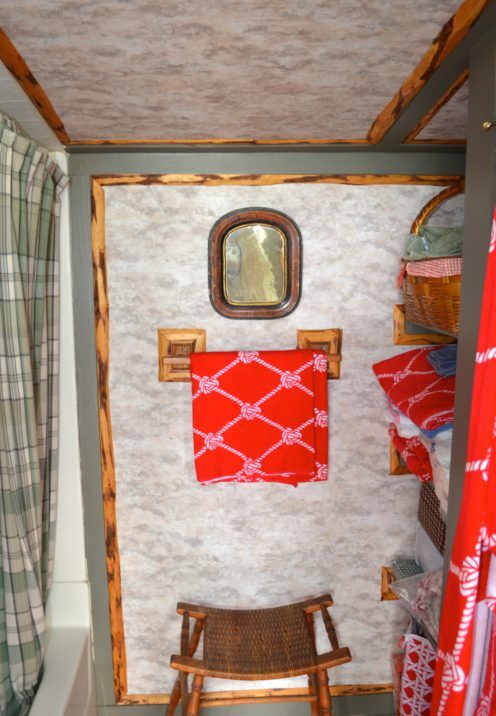 A third cabin, also with a small porch area contains another 2 bedrooms and a second bath. The 3 properties combined would make a fantastic family compound, giving extended family or guests their own private sleeping quarters. Folks would then congregate in the main house. 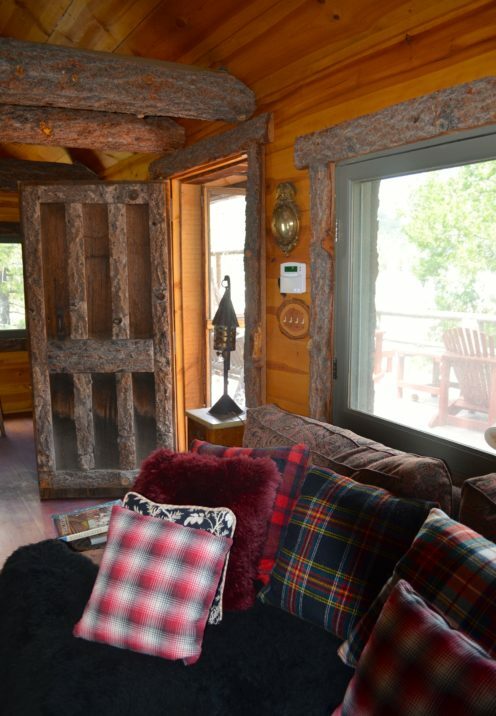 So, let me take you inside the main cabin, which is reached by way of this beautiful deck. 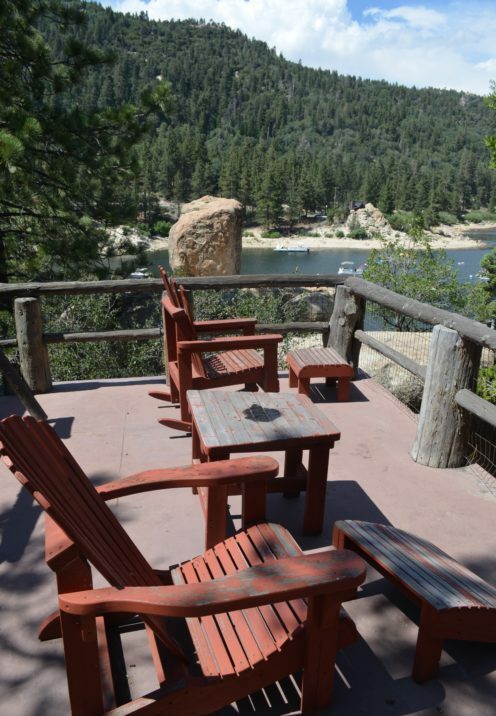 The views off of the deck are incredible! 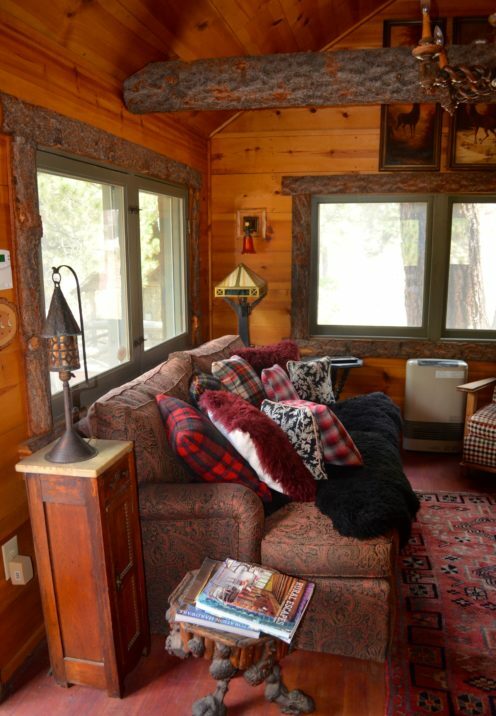 Stepping inside the old log front door you enter the living room where a couch was piled high with cozy pillows. 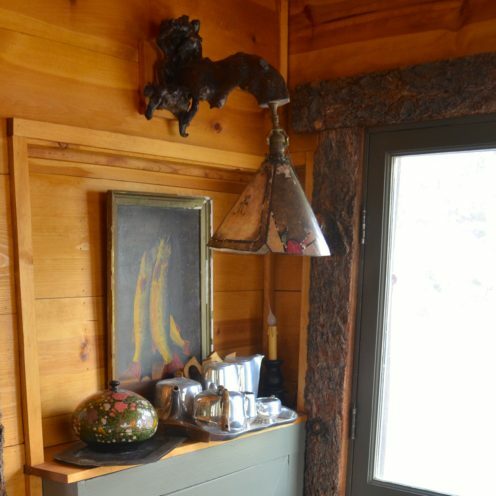 The mountainesque style decor has been carefully curated, with antiques, handcrafted burlwood accent tables, craftsman style seating, interesting old wrought iron lamps and light fixtures, and some impressive original oil paintings. 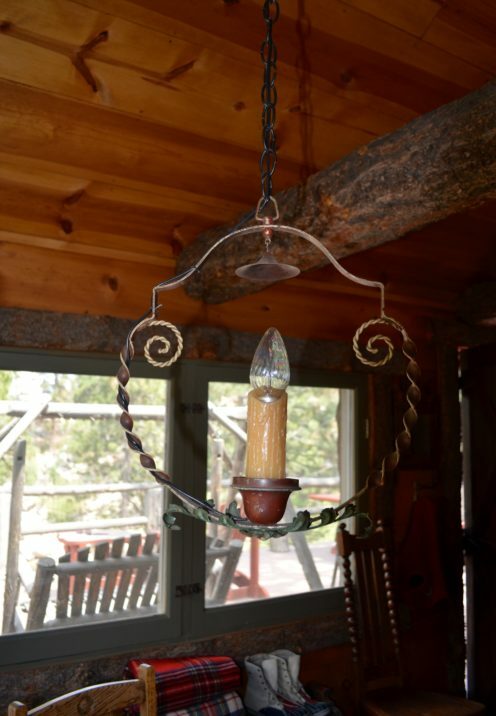 As I’m in the hand-forged wrought iron business, I especially admired this iron chandelier. One day I will duplicate it to have one for myself. The massive log beams still covered in bark were so beautiful! 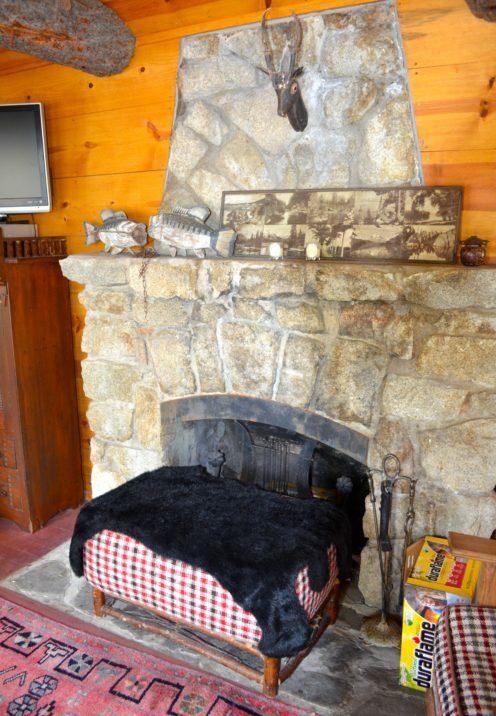 And the original stone fireplace was impressive as well. The living area connected to a small dining area that opened into a petite galley kitchen. 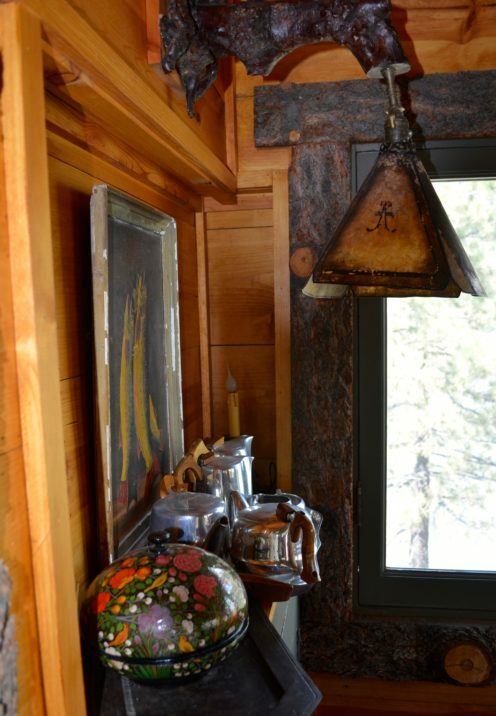 A small window in the dining nook frames a beautiful lake view. 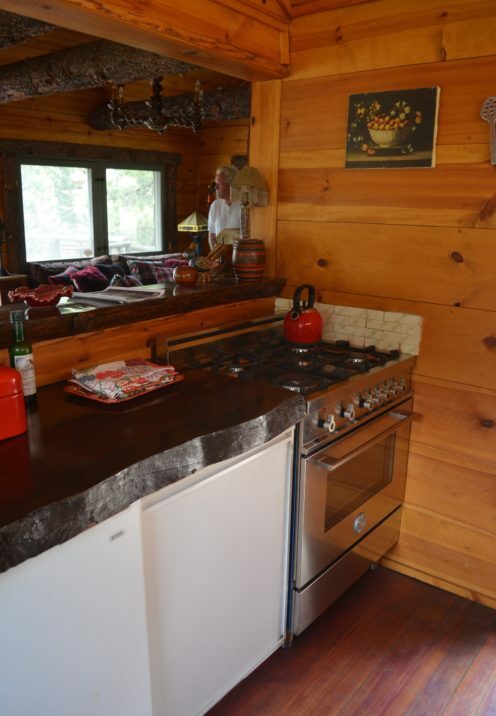 The kitchen, while small, had high-end appliances and a log countertop that must have been 6 inches thick! Everywhere you looked there was a unique find, a special treasure or interesting collection of curios. The light fixtures were like none I have ever seen before, fashioned out of gnarly wood and stained glass. 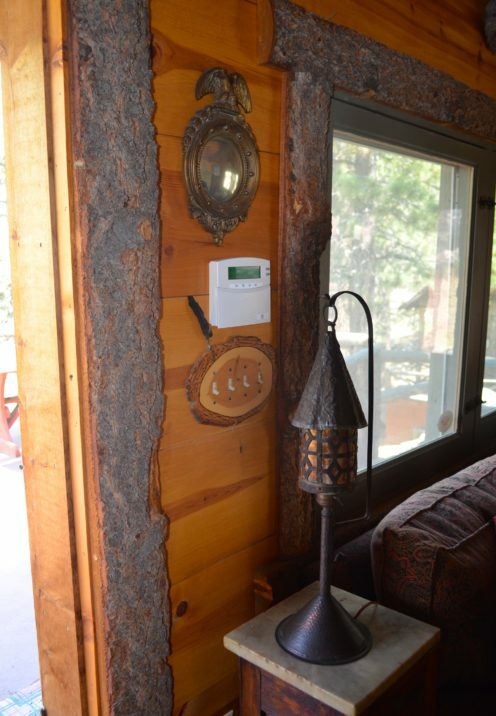 and slices of logs were fashioned into light switch covers. 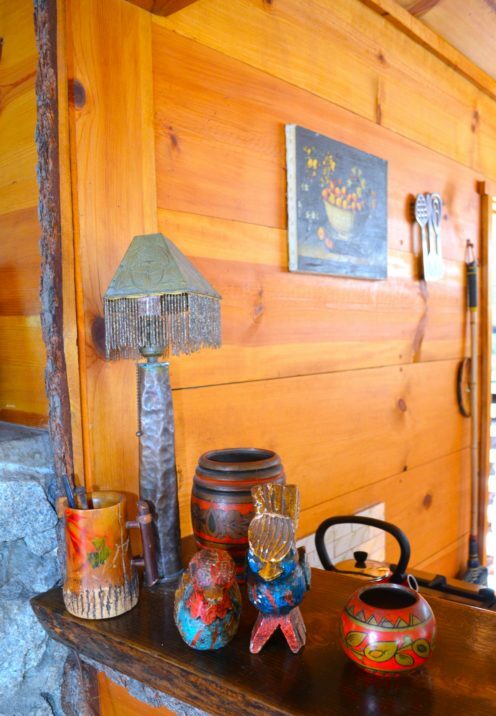 Lots of love and talent went into both the construction of this home and the interior decoration. 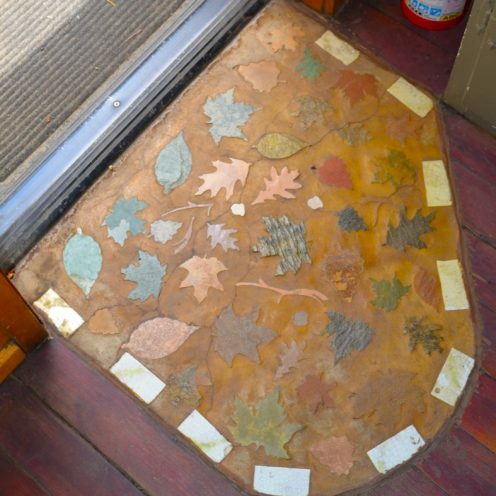 The rear exit was located in the kitchen and had the most beautiful mosaic patch of floor at the doorway. 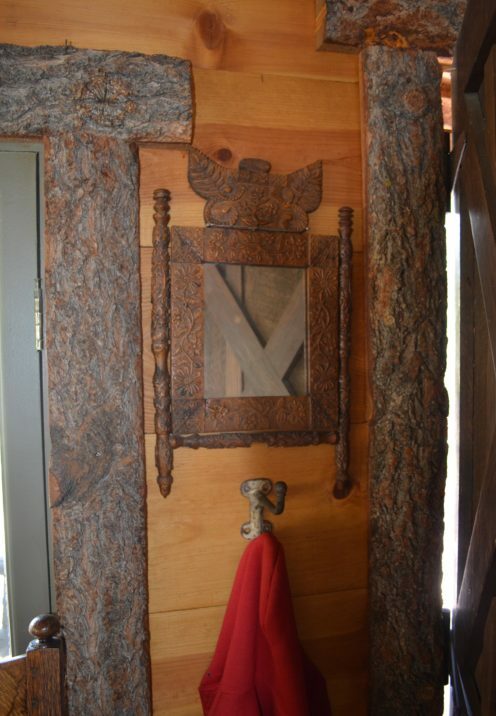 The builder of this home was a true artisan. 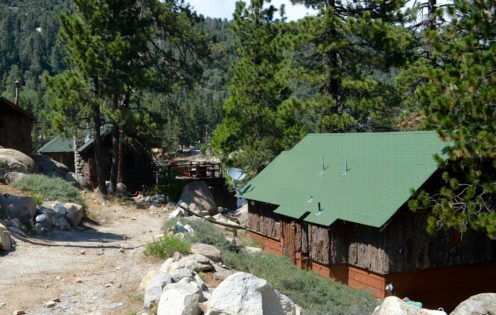 We traversed a few steps and entered the adjacent cabin that housed 2 bedrooms and a bath. 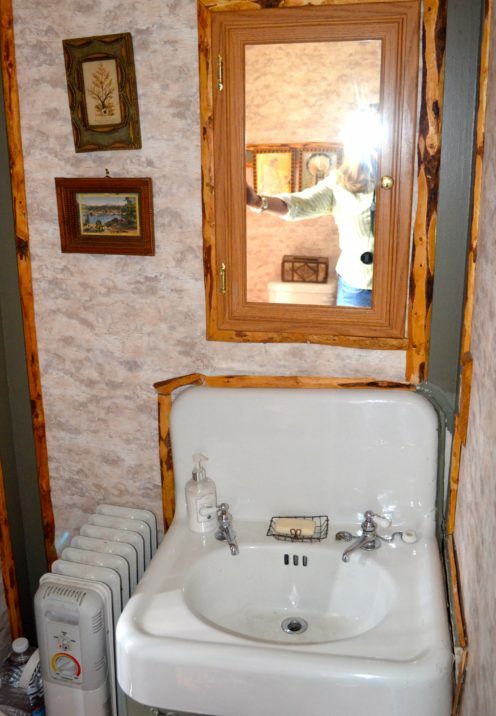 It was impossible to photograph the small but darling bathroom without catching a reflection of myself in the mirror. One of these days I’ll learn photoshop! 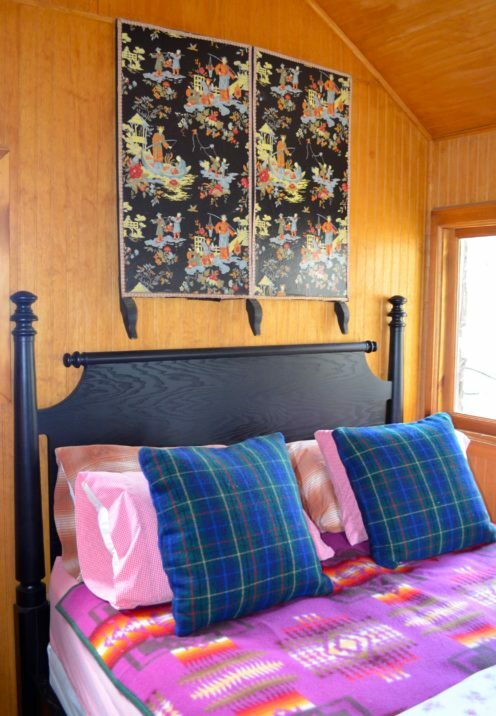 The second bedroom was Chinese-meets-the-mountains. 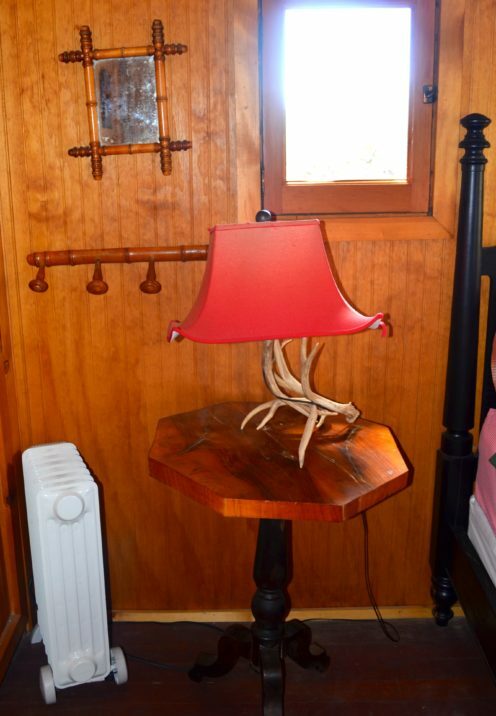 The interesting juxtaposition of the red Chinese pagoda lampshade on antlers somehow worked. Exiting the 1st bunkhouse we made our way down to the next one. 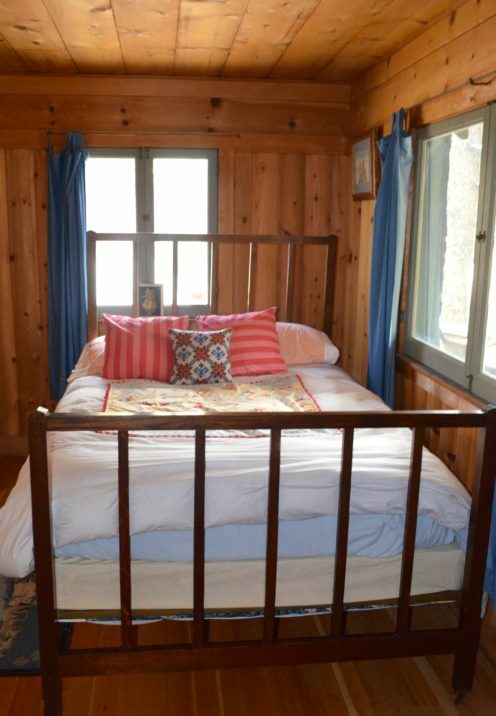 Inside was this small bedroom with a reclaimed wood headboard that I wanted to steal. This was the other less impressive bedroom. 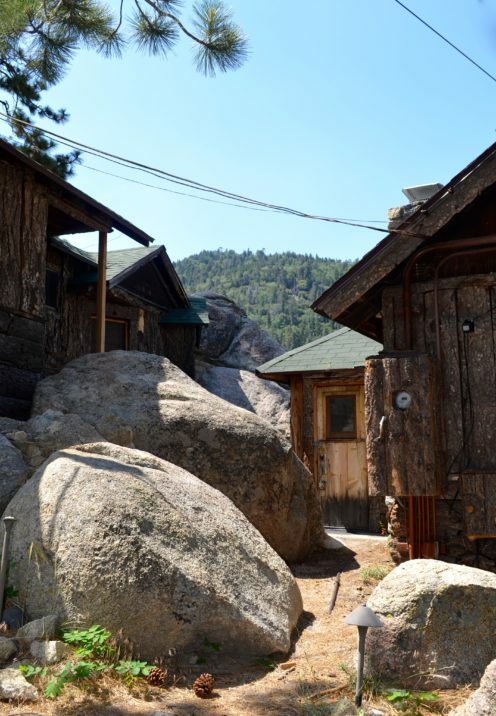 But the piece de resistance was the land these cabins were situated on. 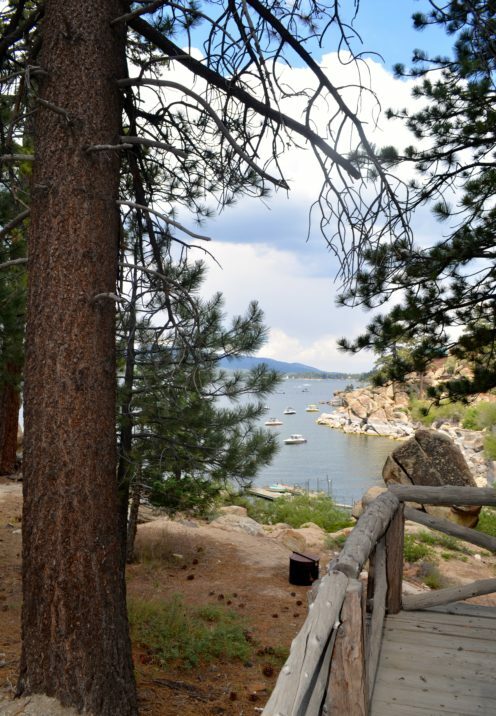 Just below is a small, private, protected cove with its own boat dock. 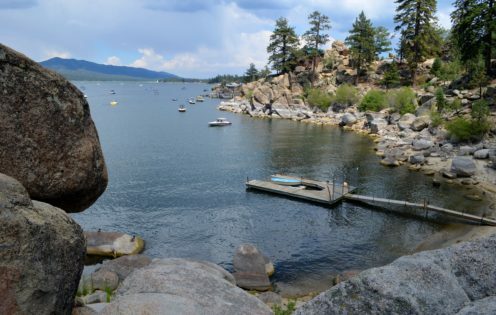 Who wouldn’t want to spend every day and night of one’s summer in this charming abode, in and among these impressive boulders and on this lovely beach. 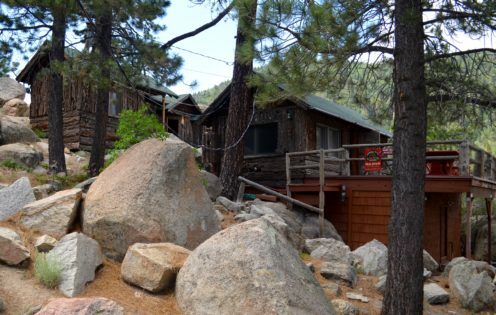 This cabin compound is a real gem, a property that could never be duplicated and has few rivals. It’s difficult to imagine why Rebecca Romijn and Jerry O’Connell wanted to sell this property. We were told that since having their twins they rarely used it. I’d think their kids would have loved growing up spending time here. Well, in any case, I have no doubt that the new owners must feel like they purchased paradise. Don’t you agree?